No, Kim Davis isn’t a martyr. But legally, she’s not wrong. I’m dragging Dull Razor out of its dusty closet as a place to post my collected thoughts on the Kim Davis situation and its legal and moral ramifications. I’ll start with my fundamental assumptions: legally, I’m a fan of the Constitution and a pretty literal reading thereof. I generally err on the side of “more freedom.” Morally, as a Christian, I think one is beholden first to God and then to the government as His agent – in other words, one should seek to cooperate and abide within the legal system as much as possible without going against God’s law before resorting to breaking it. When I first initially heard about the Kim Davis story, what I read was that a county clerk was refusing to perform gay marriages. That was it. The initial reporting was that she believed they were wrong, and so she wanted to put a stop to them. Hearing that, my immediate reaction was “well, Title VII doesn’t apply here since she’s a public employee, so she needs to quit.” I argued as much with a few friends and on Facebook about it, even as I laughed along with Mollie Hemingway at all the people who tried to turn her faith against her in ignorant fashion. Legislatively addressing the entire marriage license scheme in light of the Obergefell decision. And then, I read a great piece by the inimitable Eugene Volokh on the subject, who pointed out something I’d somehow missed: Kentucky’s RFRA, as well as the Federal RFRA, do apply here, and those were the grounds for Davis’ request. Now several of these options seem to be easy for the state to provide, given their requirement under the RFRA to provide exemptions so long as there is no fundamental undermining of a compelling government interest. In other words – it’s cheap to remove her name from the licenses, and doing so does not undermine KY’s interest in any substantial way, so they would be required to do so. But the local KY federal district court judge rejected her argument saying that having her name on the marriage licenses wasn’t a burden. Volokh points out that this is quite an error in judgement on the judge’s part, to the point of outright contradicting the most basic elements of Kentucky law. Davis refused to keep issuing licenses with her name on them, and the judge took the rather controversial route of tossing her in jail, rather than, say, fining her. But here’s where it gets really interesting, for me at least. 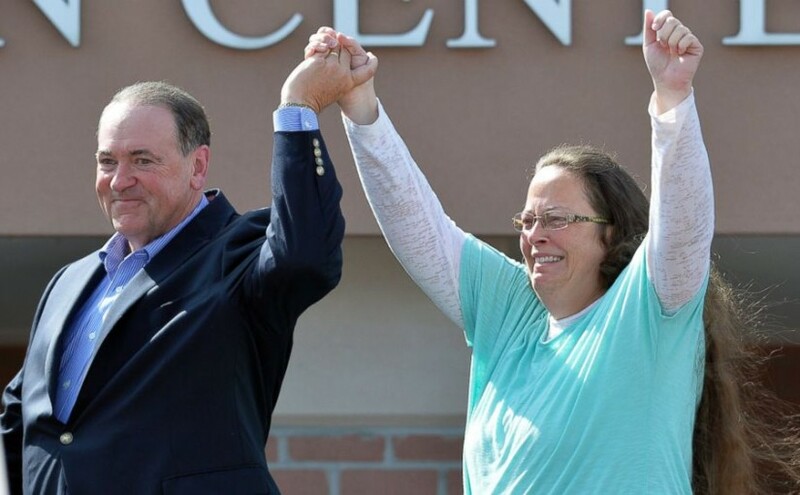 While Davis was in jail, clerks issued marriage licenses using “Rowan County” in the place where her name would normally be – which is almost exactly what she asked for in her appeal and was told would not be possible, or would result in illegal licenses. The plaintiffs don’t have any problem with that change, but Davis’ lawyers wanted it clarified that the licenses are being issued by another entity than her, and that’s where the current question lies – can she get her accommodation? And are those licenses issued while she was in jail even legal? Will she file an appeal with the state, as Volokh suggests? I think that’s her best option. Assuming that, then legally, Davis still had the option of resigning her position, which would have kept her out of jail. Her “martyrdom” is one of her own making in that sense, not comparable (as I’ve seen some claim) to Daniel’s sentence to the lions’ den, as Daniel had no way out from under Darius’ decree. But, like Paul, Davis sought to use the legal system to her benefit. Paul escaped a beating and demanded his fair trial as a Roman citizen – Davis demanded her rights under RFRA to religious freedom. Despite the memes popping up on Facebook and Reddit, that actually does have meaning. Christians, along with anyone who believes in religious freedom and the Constitution of this nation, should be rightly upset with the judge’s decision, and hoping for relief if she files in state court. But at the same time, she isn’t a blameless victim in all this. Whether it’s her pride or she honestly believes she’s fighting injustice, I don’t know – but from the moment she defied the judge’s order onward, she’s brought anything that comes on herself. Posted on September 10, 2015 Categories christianity, politicsTags Christianity, constitution, gay marriage, Huckabee, kim davis, rfra, volokhLeave a comment on No, Kim Davis isn’t a martyr. But legally, she’s not wrong. Is our President engaging in an act of sedition? My friend Scott pointed me to this today – we may have a legitimate Constitutional crisis unfolding in Washington, ladies and gentlemen. To recap the story so far: The “Obamacare” health care bill that was passed mandates that individuals purchase health insurance. This is obviously and dramatically beyond the scope of government powers granted in the constitution. A Federal Judge ruled it unconstitutional for this reason – specifically stating that the declaratory judgement was equivalent to an injunction in this case (nothing new, this is based on precedent) – and because there is no severability clause in the bill, the entire bill is thus rendered moot. Appeal and ask for a stay pending its hearing. The White House officials said that the ruling would not have an impact on implementation of the law, which is being phased in gradually. (The individual mandate, for example, does not begin until 2014.) They said that states cannot use the ruling as a basis to delay implementation in part because the ruling does not rest on “anything like a conventional Constitutional analysis.” Twenty-six states were involved in the lawsuit. “We don’t believe this kind of judicial activism will be upheld and we are confident that the Affordable Care Act will ultimately be declared constitutional by the courts,” she added. Did you hear me? Obamacare is null and void. Today. Right now. And it will remain so unless and until the US Government appeals and Judge Vinson is overruled. The Appellate Court and/or the Supreme Court can agree to hear the case, but the Executive Branch can’t enforce it in any way unless a stay is granted. And if the higher court either upholds the lower court’s ruling or declines to take the case, then the only way to enact such a law is to pass a Constitutional Amendment. That’s THE LAW. I don’t care if you like the law or don’t. I don’t care if you like Obama or Obamacare, or don’t. It is the system of rules by which every President and every Judge and Justice must play. If and when they step outside that system then they have no rightful authority and their actions against the system constitute insurrection, or conspiracy to same, which is called sedition. Any of these acts is grounds for impeachment. There you have it, folks. How do you feel about the President baldly ignoring the Constitution of the United States, and then publicly stating he refuses to be held accountable by it? Do you care yet? Posted on February 1, 2011 February 1, 2011 Categories politicsTags constitution, judge, law, Obama, obamacareLeave a comment on Is our President engaging in an act of sedition?